Synthetic peptide (Human) - which represented a portion of human Replication Factor C 437 kDa subunit encoded in part by exons 10 and 11. Our Abpromise guarantee covers the use of ab3618 in the following tested applications. WB 1/500 - 1/5000. 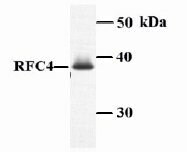 Detects a band of approximately 37 kDa (predicted molecular weight: 37 kDa). The elongation of primed DNA templates by DNA polymerase delta and epsilon requires the action of the accessory proteins proliferating cell nuclear antigen (PCNA) and activator 1. This subunit may be involved in the elongation of the multiprimed DNA template. ab3618 has not yet been referenced specifically in any publications. Publishing research using ab3618? Please let us know so that we can cite the reference in this datasheet. There are currently no Customer reviews or Questions for ab3618.